Say Goodbye to "I Can't Believe We're Out of Hot Water Already!" Tired of running out of hot water when you shower? Want to reduce your water heating bill, which is the second-largest part of your home's energy bills? Tankless water heaters provide an unlimited stream of hot water to your home--and can save you 30% on your water heating bill in the process! Interested in a tankless water heater in your home? Contact us online or call 1-800-888-1045. Tankless water heaters heat water on demand--unlike traditional water heaters that are constantly heating water in a storage tank and wasting energy. Delivers hot water on demand - Can provide unlimited hot water on demand. Saves you money- According to Energystar.gov, "ENERGY STAR qualified tankless water heaters save the typical family more than $100 per year on gas bills compared to a standard storage model." Lives twice as long as traditional water heaters - Tankless water heaters are built to last--living 20+ years. That's almost double a traditional gas water heater’s life, according to Consumer Reports. 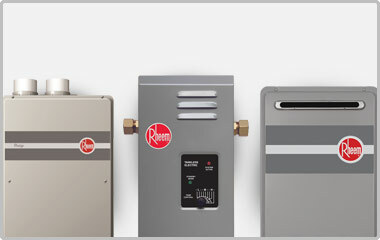 Takes up very little space- Tankless water heaters aren't big and bulky like their traditional cousins. That means they can be installed in more places—even outside on a wall. This gives you more room for other things, reducing the overall clutter of your home. Can You Retrofit My Home for a Tankless Water Heater? Absolutely. If you currently have a traditional tank water heater, we can retrofit your home for a new tankless water heating system. And the installation only takes us a day! You'll have unlimited, on-demand hot water before you know it. Ready to get hot water on demand and reduced water heating bills? Contact us online or call 1-800-888-1045. Sundance Energy provides and installs Rinnai and Navien brand tankless water heaters throughout King, Snohomish, Skagit and Island Counties in Washington.